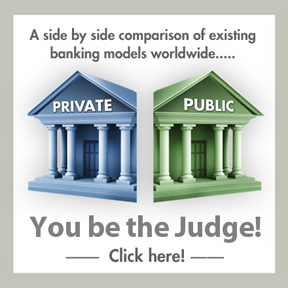 Our Current System » Public Banking Forum of Ireland – Germany has 70% Public/Community Banks! Please also check out the “Public Banking” tab for alternatives to our current system. “You have hospital wards shutting down, you have schools shutting down, you have public services that are now being curtailed because there’s no money. The money’s gone to the banks. Your money, my money – everyone’s money has gone to the banks. What we need is for the regulation that exists to be enforced”. JONATHAN SUGARMAN: “So when you think of the fact that when Nick Leeson brought down Barings Bank, it collapsed over eight hundred million pounds, I was signing over five billion every day that we didn’t have”. 4:40 The purported “Lender” (Your Bank) then steps aside to function as the Manager and continue to appear as if they were the only party you are dealing with. You start paying back the loan & start paying back the imposters a second time. If your property is re-possessed the lender will sell your property and get paid a third time. 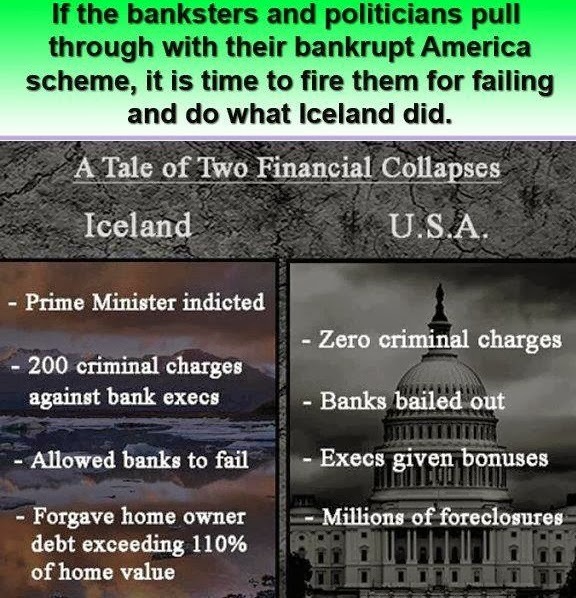 They also own the mortgage insurer who will cover them for any shortfall in the sale to then come after you for the full original loan amount again to get paid a fourth time. 8:30 The Trust was setup by the manager for the very purpose to flip the loans until it would cash and nothing else. This constructed internal sale is in fact nothing than major tax evasion; as the seller is paid in full for your note totally Tax free and every time they click further principle payments from you. Reggie Middleton uncovers extremely unnerving omissions, misrepresentations and what appears to many lay persons as outright fraud in the Irish banking system along with an in depth interview with Max Keiser in London. He names several banks directly, some which have already failed, been bailed out and collapsed their investor’s capital, others who are still operating, taking deposits and making loans. Directly after Mr. Middleton’s Irish bank expose series started, the head of the Bank of Ireland (Ireland’s main bank regulator and what used to be their reserve bank until the ECB took over) unexpectedly resigned and actually decided to forgo his 100,000 euro bonus. Hmmmm!!!! Mr. Middleton discusses the distinct possibility of the Irish people getting “Cyprus’d” and offers tools that they can use to mitigate the risk and ascertain how bad off their country really is. A tour de force in blogging and investigative, analytical journalism through this “new media”. A challenge for the mainstream media to meet, any day! 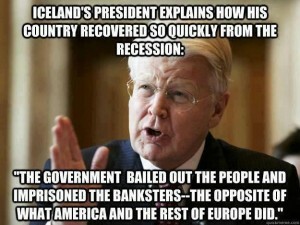 To date the Irish people have paid €69.7bn to bail out Banks. This includes €20.7bn taken out of our national pension reserve fund. €40bn has gone to bail out Private European Banks & The Euro. This is €15,000 for every man wonan and child in the country. There is also €28.1bn of Promissory Note Bonds about to be sold by the Central Bank of Ireland onto the International money market. This is a further €28.1bn of debt for the Irish people. How much money do they create? What do they do with the money they create? He shares some very interesting and profoundly important facts and shows how far the reality of banking is away from the text-book model of banking and which major implications the current system has on our lives. How do banks create money out of nothing? How do they create money as debt? We recommend it as an educational tool and encourage the widest distribution and use by all groups concerned with the present unsustainable monetary system. Presented at the Positive Money Conference in London. Following the disclosure of taped conversations of executives of Anglo Irish Bank discussing the bank guarantee, which cost Ireland its economic independence, the Irish Independent called the Central Bank “incompetent” in June 2013. The transcripts showed the executives referring to the Central Bank as “our buddies in Dame Street” as being a “shower of clowns” who were “effectively egging us [Anglo] on” to break the law. German Chancellor Angela Merkel said the calls were “contemptible”. Senior politicians expressed astonishment when the Central Bank announced it would not be making criminal complaints either to the gardai or the Office of the Director of Corporate Enforcement over the tapes. An internal whistleblower revealed problems with the CBOI’s outsourcing of its IT infrastructure. “Ask yourself this, what would be the consequences of any type of [data leak]? Even if the breach did not touch the money transfers and was only information, much of it is commercially sensitive and the possible liability [to the taxpayer] large,” After their outsourced computers crashed, Sinn Féin’s finance spokesperson, Pearse Doherty, said “I wonder if Irish people would be happy to know that all the data for the most important bank in the State is being held in a private company’s control centre which has experienced one power blackout already this year?”Months later following another IT crash, a staff member wrote to a TD claiming that the “IT system has been unstable since being moved, (separate to the process failures), yet they continue to move more and more systems out while the instability continues”. Ireland is hoping to be the home of Sharia Islamic finance in Europe. Enda Kenny told the Irish Funds Industry Association that he was doing everything he could to “ensure” Dublin became “a centre of excellence for Islamic finances”. These efforts received a setback when a product approved by the CBOI as Sharia compliant, was found by to have violated Islamic law in Malaysia and could warrant a penalty of up to 8 years in jail. The Irish League of Credit Unions in response to the consolidation of the sector, accused the CBOI of acting beyond its statutory powers and “cloak the proceedings and the challenge to its decisions from public scrutiny” and added that it was “important that State regulators operate openly, clearly and accountably”, and it warned the Central Bank against trying “to scare the public or exaggerate risk for the sake of achieving unarticulated policy objectives.” The cost to the State of the rationalisation is expected to be in the region of €1 billion. Following the collapse of Ireland’s oldest and third largest stockbroker, Bloxham Stockbrokers after the firm had been discovered to be cooking its books for five years, the CBOI refused to answer questions about regulatory failure or confirm that it will publish a report outlining what went wrong and how to make sure something like this does not happen again. They did not refer anyone to the Gardai or the Director of Public Prosecutions. The CBOI were aware of “corporate governance issues” at Ireland’s largest credit union in Newbridge for 8 years before it had to bailed out by the state at a cost of €54m. Edit by PBFI. The Government took €54m from the Credit Union Rescue fund & gave it to The Permanent TSB. It is now believed that €8m could have saved Newbridge Credit Union. Saving Newbridge CU was not the aim of the CBI or Government. Debt experts authorised to strike deals through the Insolvency Service of Ireland, were threatened with criminal prosecution by the Central Bank unless they became regulated by themselves notwithstanding that both accountants and lawyers are already regulated by their own respective professional associations. The extra red tape made some of the experts jobs “unworkable” resulting in delays for borrowers trying to resolve their debt problems. In November 2013, the organisation was caught napping at the wheel when its regulation failed to detect “accounting issues” at the country’s largest car insurer RSA/123.ie. The problems had being occurring for at least 2 years and its foreign parent had to inject €83m to keep its Irish subsidiary in business. Outcry Against Banking Practices with Michael Tellinger. Author, researcher and scientist, Michael Tellinger has just filed his 1,100 page notice of motion against Standard Bank (South Africa) in the Constitutional Court, accusing the bank of “unlawful and unconstitutional activity”. He also served the notice on the Reserve Bank and the Minister of Finance.